Beautiful set of 5 Arkansas Double Terminated (DTs)/Sceptre Quartz crystals - super for gridding layouts or place one on your Reiki/Energy Board for a more refined energy output. As well as having the usual properties of Quartz, specimens from Arkansas have their own particular energies also. Arkansas Quartz is purer and clearer than almost any other found in the world. In fact, the finer crystals are pure enough to make synthetic quartz used in computer components. 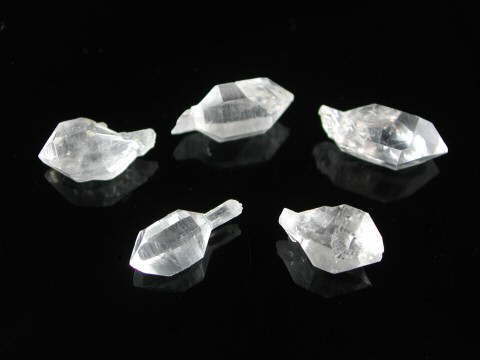 Sometimes referred to as ‘Arkansas Diamonds’, Clear Quartz from Arkansas (especially from the Old Coleman Mine) is recognized as some of the purest in the world and samples from this particular mine are used as the benchmark of the chemical purity of Quartz worldwide. Quartz from this area tends to have a more refined energy than that from Brazil.